Are you interested in earning college credit in high school? Want to experience college and even save your family money? At ALHS, we offer multiple ways to support your college dreams while in high school, from taking college classes on our campus to earning college credit for skills you may already possess, such as Spanish language fluency. Learn more by reading this printable flier and scrolling below. Concurrent Enrollment: Students at Lincoln have a variety of opportunities to earn college credit through our partnerships with the Community College of Denver, CU Succeeds and Metro State University. Students must earn at least a C- in the concurrent enrollment classes to earn college credit. Learn more. ASCENT: Accelerating Students through Concurrent ENrollmenT or ASCENT is a program that gives ALHS students the opportunity to attend college as full-time students if they meet specific qualifications. Denver Public Schools pays tuition, fees and cost of textbooks for one full year of college. Learn more. Advanced Placement: Students who take Advanced Placement classes at ALHS and pass the final AP tests with a score of 3 or above can earn college credit. Depending on the university, students may earn more credit with a score of 5 (the highest possible score) than a three. Learn more. CLEP: The College-Level Examination Program (CLEP) provides students the opportunity to earn college credit for what they already know. Our students have great success with the Spanish CLEP exam and have earned 6-15 college credits. Learn more. Seal of Biliteracy: In today’s competitive job market, the ability to speak, read and write in more than one language can set you apart from the crowd. DPS developed the Seal of Biliteracy to honor students who have attained high level skills in both English and another language. Learn more. Spanish minor: Students have an opportunity to complete a college minor in Spanish while enrolled at ALHS. This can be a great way for students to earn college credits for native Spanish fluency. Learn more. This placement test is used to assess student preparedness for introductory credit-bearing college courses. Based on results, students can be placed in either remediation or college-level courses. The test is computerized and adapted to skill base (questions you see are adapted to skill base). It uses multiple choice questions, as few as 12 and as many as 40, and takes two hours or less. The test is given to all 11th-grade students and is organized, administered, proctored and interpreted by school counselors. We use this as a measure of college readiness and as a tool to schedule students into English classes during the senior year. 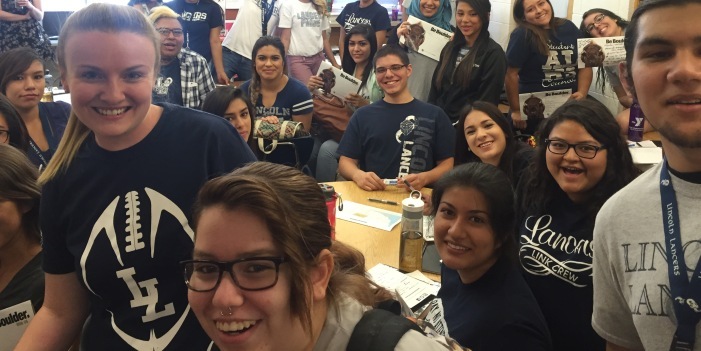 College is not only accessible to ALHS students, but can be affordable as well! Founded by ALHS graduate Tim Marquez, the Denver Scholarship Foundation provides the tools, knowledge and financial resources essential for success in college. DSF makes college possible for thousands of DPS graduates each year. Learn more about DSF by visiting the Future Center, room 112, at ALHS or visiting the DSF website. Students who are undocumented or DACA do not qualify for federal financial aid, but have access to other financial resources to help pay for college! DSF has a database of scholarships available (Future Center, room 112), and there is private funding available at some colleges/universities. The Pell Grant (named after Claiborne Pell), is money from the US Government given to students to pay for college. Grants do NOT have to be repaid. Federal Pell Grants are provided to students based on financial need of families. They are the SINGLE LARGEST SOURCE of grant aid for college/university/trade school. The Federal Perkins Loan Program provides money for college or career school for students with financial need. This is money that you will pay back, but is at a low interest rate. Students who qualify for this loan are students who demonstrate financial need. Learn more about help paying for college and becoming college ready on the DPS College and Career Ready website.